Launched August 13, 2017! 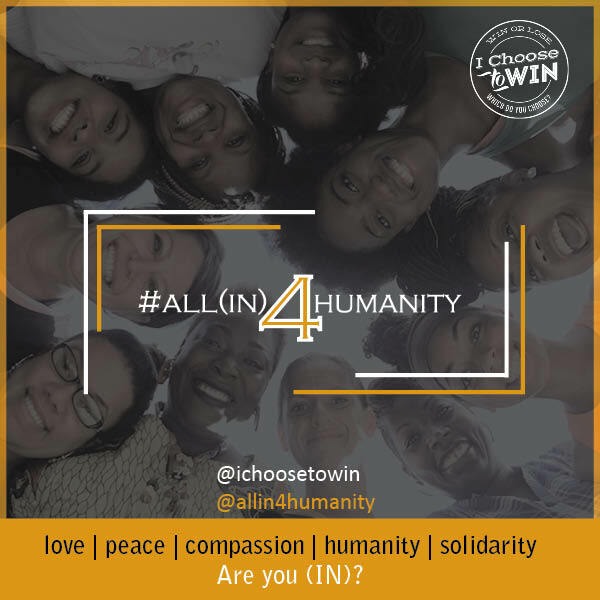 Check out #allin4humanity, a social campaign created by I Choose To Win to restore love, peace, compassion, humanity and solidarity. It’s launch timing was a direct response to the white supremacist rally at Charlottesville, VA this August. We must do something, no matter how little we believe our actions are. It starts with me. It starts with you. Together, we WIN. 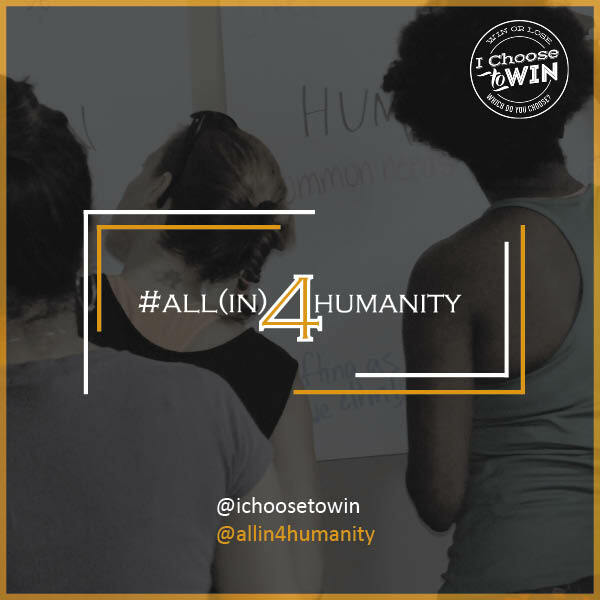 All(IN)4Humanity is the social campaign that was birthed out of the 2016 I Choose To Win retreat entitled, “All Hands On Deck” where we invited diverse women to join in an overnight retreat to address what everyday people can do to combat racism and restore love. Like many Americans, we wanted to do something about the racially charged climate in the U.S. and concerns about social injustice facing our nation. But, we didn’t know where to begin or what we could do to truly make an impact. So, a group of diverse individuals in the Philadelphia, PA area retreated from the noise and came together to brainstorm. Out of it came this campaign, #ALL(IN)4Humanity, which acknowledged our need to deal internally (it starts with me) to impact change externally (be the change we hope to see). 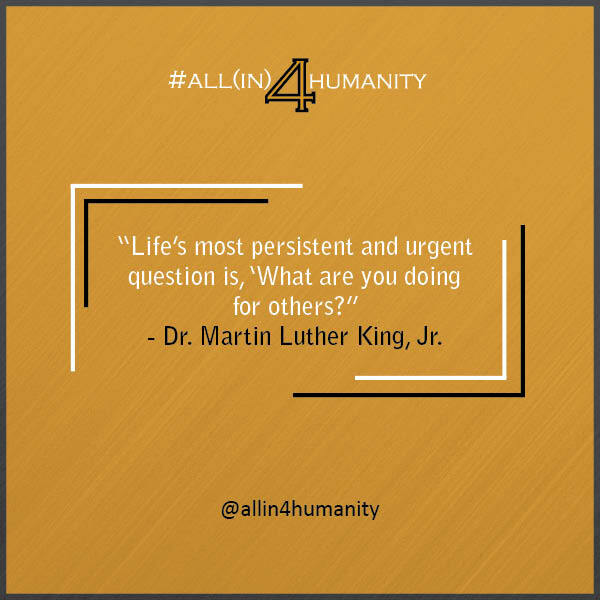 We are #ALL(IN)4HUMANITY, an online campaign for individuals who are ALL IN for restoring love, peace, compassion, humanity and solidarity in our nation. We are responding with the fierce urgency of now, because Dr. King taught us the right time to do the right thing is always now. We are a diverse group, representing many races, cultures and ethnicities with an agenda, a mission, a charge: because people matter to God, they matter to us. We are everyday people, like you, who have decided to take action – with the resources we already have and within the circles we already run. And, we started this campaign to invite others, like you, to do the same. JOIN US! Decide on at least ONE meaningful action-step (of your choosing) toward mending human relations by either supporting or advocating on behalf of a group who’s been marginalized, increasing understanding around the injustices, acknowledging your own bigotry and biases, and/or standing in solidarity to fight for reform because an injustice anywhere is a threat to justice everywhere. 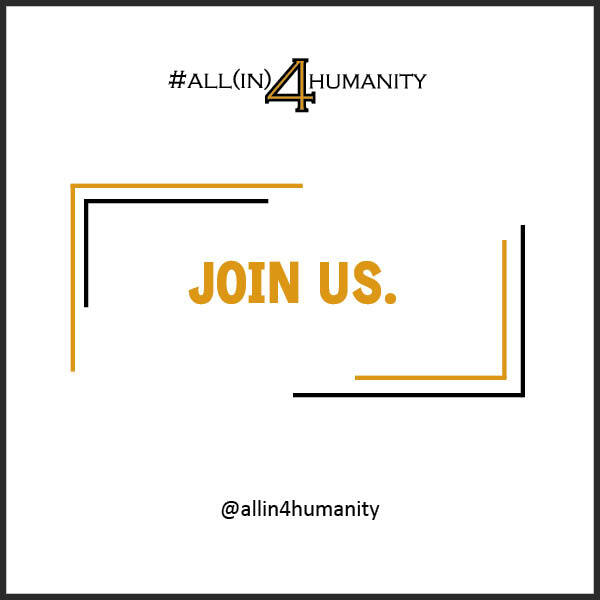 In part of the campaign design, you MUST do it within 10 days and tag others by asking if they’re “ALL IN.” Then, let us know how it goes using hashtag #allin4humanity. It starts with me. It starts with you. It’s up to us. Together, we WIN. We are looking for a few corporate sponsors to support community-wide initiatives in part of this campaign. We are looking for brand ambassadors and volunteers to help promote the campaign via social media. Looking for financial support to build a marketing budget for extensive reach and support. Stay tuned. Let us know – Are you All (IN)?